Opening this week, Cat has been invited to be a guest on “The Talk” a tv talk show (also on CBS) to discuss Supergirl. I admit I often find it strange when real life programs such as this are included in television shows, but it served an important roll here, to demonstrate Cat’s faith in Supergirl. Kara seems to be in a place where everything is going well for her. She is finally starting to realize she might have an opportunity romantically with James, she was able to rescue a little girl from bullies (showing no injustice is to small) and Senator Crane, once a fierce opponent of aliens, is now actively trying to aid the DEO and secure funding so that they can do their job better. Clearly Supergirl rescuing her from the White Martian has brought Crane around to Supergirl’s side. While at the DEO they are alerted to a fire on a building with a fireman trapped on the roof. He’s not alone, but his teammates were unable to rescue him. What Kara didn’t see was that hidden among the debris was a chunk of Red Kryptonite. Depending on the story, Red Kryptonite has had various effects throughout the years in comics and television shows. But often it is used as a way to bring out a kryptonian’s dark side, bringing relatively small thoughts and insecurities to the surface. Back at the DEO, and before the effects of the Red K have made themselves truly known, Kara is starting to show signs of being different. She ignored Hank during a mission briefing regarding another Fort Rozz escapee, this time a K’Hund (an alien race often at odds with the Green Lanterns in the comics). Supergirl finds the K’Hund and easily defeats him. Instead of detaining him, she chooses to let him go, as he isn’t worth the time or hassle. Hank chastises her for letting the K’Hund go which starts an argument about using his own powers. Kara doesn’t understand why he won’t put himself out there the way she does. You talk about honoring your people and yet you refuse to be one of them. This will come back to bite her later, but if it wasn’t clear before, Hank and Alex are starting to pick up on the fact that something is wrong with Supergirl. That evening, while at a dance club Kara continues to act out of character coming on to James very overtly. Like nearly every other show or movie where the hero is temporarily “not themselves” there is an awkward dancing scene that’s supposed to show how different from her usual self Kara is acting. Before it gets to out of control though, Cat calls James so that he can send a message to Supergirl for her. Supergirl goes to meet, or rather confront, Cat. Basically she belittles Cat the entire time, when it’s clear that Cat was concerned for her. To show Cat who really has power, Supergirl threw her off the building, catching her moments before she would have hit the pavement. This drives Cat into putting out a tv broadcast denouncing Supergirl, stating how dangerous she has become. It was a pretty powerful scene, especially considering her appearance on “The Talk” at the start of the episode. At this point, Max Lord shows up at the DEO and explains that he was actually behind the Red K. He claims he was just developing a weapon to use against Non, but Alex doesn’t believe him. You would think he would have come up with a better story. There is no way that he could really believe that Non would have fallen for a trap that involved rescuing humans. Lord may be highly intelligent, but that wasn’t his best idea. Senator Crane, still at the DEO more or less forces Hank’s hands into going after Supergirl. He gets to work with the DEO to try and build a weapon to stop the effects of the Red K.
While indebted to Supergirl for saving her life, Crane once again believes her to be an alien threat. 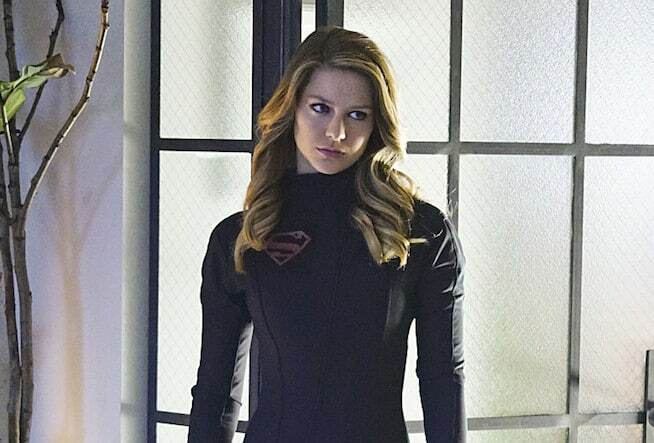 When Alex goes to Kara to try and explain about the Red K, she finds Kara wearing a similar uniform to Non and his army. I assume she made it, but I was curious where it came from. Supergirl goes on a rampage, destroying a large television screen that was playing Cat’s broadcast, and getting into a firefight with the police. When the DEO arrives Supergirl effortlessly throws Hank away and breaks Alex’s arm. It looked like Supergirl was going to kill Alex, forcing Hank’s hand. Remember when Kara was challenging Hank to out himself? In full view of the other DEO agents, police, and bystanders he changes into the Martian Manhunter to save Alex. I really enjoyed his battle with Supergirl. The effects and choreography were great. As they plowed up the side of a building I briefly found their fight reminiscent of the Superman vs Zod fight in “Man of Steel.” The Manhunter was able to subdue Supergirl long enough for Alex to shoot her with Lord’s gun which neutralized the effects of the Red K. Alex tells Manhunter to run but instead he surrenders him self to the DEO’s custody. After Kara recovers, the first thing she wanted to know is if she killed anyone, and then she’s overcome with emotion as her memories of what she did come rushing back. I thought this scene was incredibly well acted by Melissa Benoist. Kara makes the rounds apologizing to people including James and Cat. She was about to confess that she loves him, but he cut her off saying he needed time. As for Cat, once again she proves to be a great mentor to Supergirl, telling her that it will be hard, but not impossible, to win back the City’s trust. The implication is that Cat’s trust is not gone forever as well. Personally I don’t believe in failure, not if you get up and face the music. That girl that Supergirl saved towards the beginning, she was later shown throwing her Supergirl clothes in the trash. I was a little surprised that Kara didn’t seek her out to apologize to her as well. Siobhan had obtained footage of Supergirl letting the K’Hund go (how exactly did she get this?) and is fired when she tries to leak the footage to Perry White (Kara turned her in). I have to assume this is the trigger for what will become her hatred of Supergirl. I’m kind of surprised we didn’t see Non attempt to recruit Supergirl this week. Seems like that would have given him the best opportunity to remove her opposition to him. Often these type of stories have little effect on the status quo in the long term, but it’s clear that isn’t the case here. Between Hank being outed as the Martian Manhunter, and Kara having to work on her relationships with both James and Alex, this one should have repercussions for awhile.